Because I thought my blog should be more than a recipe repertoire, I decided to start this fun, technique section where every Friday I will give you some helpful tips and informations about the food you eat and how to get the best of it. Today, my first subject is going to be one of my favorite fruits, and which happened to be in season in Michigan: Peach. The peach is a fruit originating from China, where it symbolizes fertility, longevity and where the peach flowers are used in Chinese wedding. There are over 400 varieties of peaches and the most popular one are the velvety and the smooth peaches. Choose them in season when they should are ripe with a delicate skin; a good color and no blemishes or finger marks. Your peach should be fragrant. If you want to keep them for a few days before eating them, then choose them a little unripe. They will continue their maturation at room temperature. Store your peaches at room temperature and without piling them up. Depending on how ripe you brought them, they will keep from two to three days in your basket. Just avoid touching them too much as they get bruises easily. Peaches don’t like spending days in the fridge, as they get dried and their flesh becomes like cotton wool. Just remember to get them out of the fridge hours before eating them so they can fully develop their aroma. Halved, pitted and blanched for two minutes in boiling water with a dash of lemon juice. Peaches with yellow flesh (nectarines, Springlady, Diamond princess, Early O’Henri, Redtop…etc) chosen just ripe can stand freezing better than other varieties. 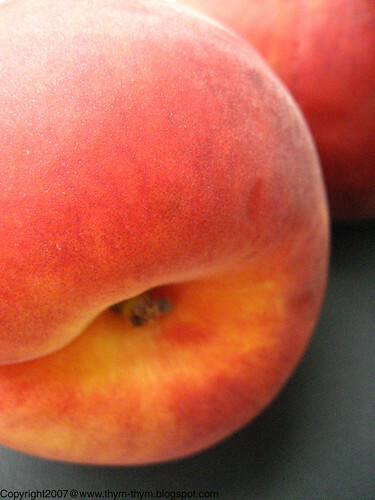 Peaches can be eaten raw or cooked. It can be baked, sautéed, caramelized, in syrup, in a jam or compote, in pies, tarts, muffins, cupcakes and cakes. Peaches go also very well with white meat and Monkfish and fresh herbs like basil and mint. Peaches are an excellent source of fiber, water, vitamin C, B3, B5 and vitamin E.
Squashed, it makes also a good, natural and moisturizing facial masque; at least if you can stop yourself or others from licking your face constantly. My peaches are screaming to be taken to the kitchen for some weekend experimenting that I will be sharing with you in the near future. If you have some Peach recipes that you would like to share, please let me know in the comments. Until then, have a great weekend everyone. I have just started seeing peaches pop up at road side stands and I have been craving to stop for some! My favorite way to eat them is simple - sliced, in a bowl with a bit of milk and sugar sprinkled on top. Great idea, Rose! Look forward to reading more Friday posts. That's a good idea. I won't have to google stuff because I can just refer to your Friday posts :-) I LOVE peaches, actually, any stone fruits. I have to wait many more months before it's in season again. My favorite recipe is slow-roasted peaches with orange caramel sauce. An excellent idea. And peaches, a good choice. - Deborah: Your recipe sounds yummy, although I have never used milk with peaches before. - Thanks Wendy. You are always welcome, friday or any day. - Thank you Nore. I might not have all the informations that google has but I will do my best. - Thank you very much Lydia. - Anali: I learned that too. - Cuisineplurielle: You are very welcome. - Patricia: What a cute little girl you were. You remind me of my daughter, when she smells a flower, she autimatically wants to eat it.I hope My informations about the beauty tip is not dangerous for people. - Thank you very much Pabody. I have been working through a basket of peaches a friend gave me... we've had peaches for every meal.